American soprano Lise Lindstrom is starring in the title role of Giacomo Puccini’s Turandot at the San Diego Opera with performances on February 24 and 27, and March 2 and 4, 2018. Carl Tanner sings the tenor role of Calàf and Angel Joy Blue sings the soprano role of the faithful servant, Liù. The production is directed by Keturah Stickann. Valerio Galli is the conductor. I sat down with Lise to talk about her career and her evolution as a soprano who performs in major opera houses around the world. Eva: You’ve performed Turandot over 150 times. How do you keep this role unique and complex and how did you, in many ways, become the Turandot of reference in the major opera houses of the world? L. Lindstrom: Keeping it fresh is really my joy. As an actor, I love finding new angles to look at the character. With a role that I know so well and I’m so comfortable with, I’ve discovered that I’m not concerned any longer about navigation. That doesn’t mean I don’t pay attention to how I sing it, but I’m not worried that I’m not going to be able to do it. That allows me to be spontaneous and literally, as I sing the words, I try to sing the words as if they were new. I try, in that moment, to be open to inspiration and spontaneity, whether that’s a slightly fresher tempo than before and it certainly is always different with different colleagues. Every night on stage is a new night. I try to be open to it and allow myself to be affected by everything that is happening around me. It’s like you have a route that you drive every day from your house to the supermarket and if you challenge yourself to keep your eyes open and see something new on that route, you will. Turandot is in many ways crudely drawn. She’s very aggressive in the beginning of the opera and she’s depicted as the ice princess. She’s drawn in harsh lines. From the very beginning of singing this role, one of my challenges was to find the human side to the character because characters that are only two-dimensional are completely uninteresting. You have to find the conflict within and why she is so harsh and cruel, what makes her a sympathetic character. Why would you even want to go and see the opera Turandot if this woman is so awful? It’s my mission statement at the beginning of every production to try and find more humanity in this character. Her foil is Liù, the most sympathetic, sweet and dedicated character. It’s like apples and oranges or icebergs and tropical sunny vacations. Why would you want to listen to Turandot if you could listen to Liù all night? 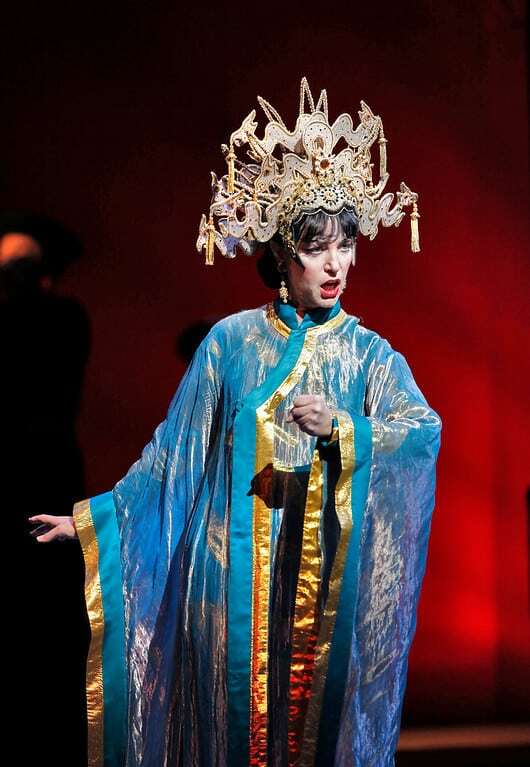 Soprano Lise Lindstrom returns to sing the title role in Puccini’s Turandot. Photo by San Diego Opera. Eva: Has your voice evolved in the years you’ve been performing this role? L. Lindstrom: Certainly but also my voice has evolved because I’ve evolved. There’s a certain natural organic process a voice goes through as it ages and grows. I’m grateful that I still have the capacity to sing this role, even within its extraordinarily demanding tessitura, because it’s really high and really aggressive. Eva: When you sing Turandot, do you model yourself after any past singers? L. Lindstrom: Yes and no. When I started singing Turandot my idol was Birgit Nilsson. I didn’t want to sound like her but I wanted to sing technically like she did because it was a healthy sound. Then I moved to Maria Callas’ Turandot. She’s a consummate actor who acts with her voice. She allows her voice to express every emotion, every thought, every blink of an eye. I find that truly exciting. Birgit and Callas would be my two cornerstones for this role but for me now, I feel that I have enough miles under my belt that I want to rely on my inner ear and my inner instinct. Eva: Who are the singers who have influenced you the most? L. Lindstrom: Birgit Nilsson, Astrid Varnay, Eleanor Steber, Helen Traubel. The latter two are both Americans but had huge international careers and just astonishing instruments, gorgeous voices, and such musicality. And Callas of course. Funnily enough, also Theo Adam, a Wagnerian bass. There’s something in the way he uses language. Language begins to be the pivotal moment because we’re basically singing Shakespearean actors. We have to be able to use a language that may not be our native language, in a way that is native enough that it is poetic, delicious, and compelling. When you listen to Theo Adam’s Wagner, a native German speaker, it’s astonishing and fantastic. Eva: Are there any singers in the distant or more recent past that you sometimes wish you could have performed with? L. Lindstrom: Oh my gosh, there are so many! I wish I’d known or been around George London. L. Lindstrom: We project what we think these people are. To me he’s a solid, good, kind, person with a canon of a voice that came through him. I think to be in a room with that would alter you in a positive way. I wish I could have sung with Pavarotti or been in a room with him singing. I would have loved to be around Callas and see what she was like in real life. I have a feeling that she was incredibly fragile but what an aura she had. Just to be around these people! An aspect of the business that has changed is also the management or business side of the business. There’s been a shift that mirrors our world, our global politics. I wish I would have known some of the old agents, presenters, and impresarios and have been around them and their enthusiasm and knowledge of the art form. For example Sol Hurok or some of the people who started the big artist agencies like Columbia Artists Management or IMG, these people who loved the classical arts and really knew how important culture is to society and therefore made it their lives’ goal to bring it to people. The professional art form has been diminished but not by the artists. Not ever by the artists. All professional artists now walk a very fine line between being commercially viable and being artists. It’s a tricky balance. Eva: Are there any singers you would wish you could perform with but it hasn’t yet been possible? L. Lindstrom: Specifically there are conductors I would wish I could sing with, like Simon Rattle. I love his enthusiasm. Everything he does has a scintillating effervescence to it. I want to be part of that. I want to be a person who can experience that and share it with the audience. 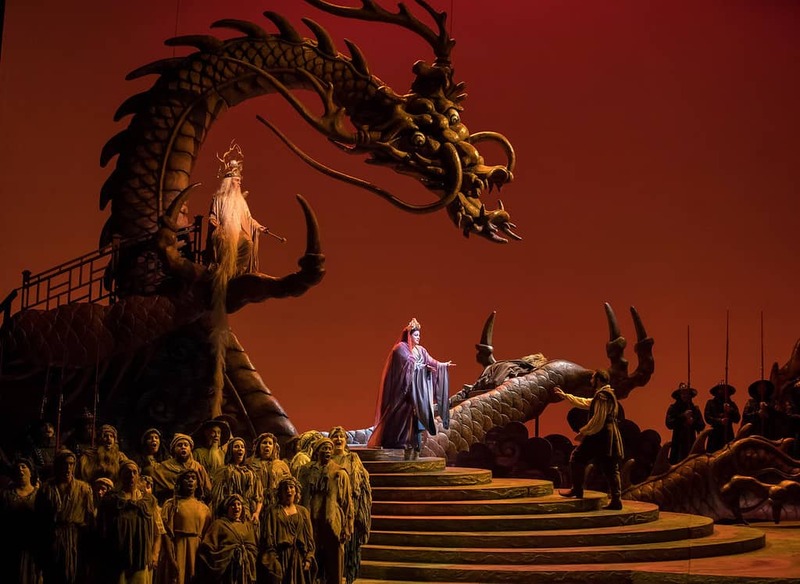 San Diego Opera Presents Puccini’s Turandot in February, 2018. Eva: Is it sometimes that the conductor is more important than the cast? L. Lindstrom: It’s always going to be a team experience but if the conductor doesn’t have a calibration or synthesis of energies, the team is going to be slightly imbalanced. Something wonderful is still going to happen because it always does. There’s a certain magic to the experience. But the conductor is maybe the most misunderstood and misinterpreted position. The conductor is the one position that doesn’t actually make any sound. Even the director places people on stage and is talking about relationships and helping the actors and singers find their motivation. Conductors don’t make any sound yet without the synergy from that position, from that man or woman in the pit, the magic could be diminished. It’s an extraordinary position. Eva: You’ve moved to singing Wagner, Brünhilde. Obviously it’s very different from singing Puccini or even Strauss. Has Brünhilde challenged you or is this a role you’ve always anticipated? L. Lindstrom: Yes and yes. I’ve always anticipated singing Brünhilde and I always wanted to but I didn’t feel worthy to do it. Those are two different things. There are things you always want to do in your life but you might not have the courage to do them. It took me a long time to get through my head that I could do Brünhilde. In many ways I consider it to be the apex of operatic literature. It’s my taste. I’m not a big fan of Wagner as a person but I’m astonished that that person managed to write what I consider to be some of the most beautiful music and beautiful language ever. It sings itself. It’s instinctive and so well put together. It’s not easy singing but from my perspective it’s not difficult. You have to know what you’re doing – no beginners allowed – but it’s good and it fits the voice. It’s bel canto and that’s what Wagner wanted. He wanted to do German bel canto and he modeled it after Rossini, Donizetti, and Bellini. He managed it though not in his earlier operas – not in Fliegende Holländer, not in Rienzi, nor in Liebesverbot, but once he got to the Ring Cycle, he knew what he was doing. Eva: Why did you say you had to feel worthy of it? L. Lindstrom: It’s because I thought so highly of it and all the legends like Flagstadt, Nilsson, Varnay, and Melchior – the list of people who have sung Wagner goes on and on. They’re legends. Who am I to do that but just a kid from California? Eva: How has you voice evolved for Wagner? L. Lindstrom: Singing the Wagnerian repertoire allowed me to experience more colors in my voice and to really relax into my entire instrument. Turandot was a great start for me. It got my voice settled into its centered and grounded position but then Wagner allowed me to start having more space, more depth of experimentation. It’s a natural experience in getting older, living longer, working more and longer, but also it’s repertoire. There is more me there now. And the character Brünhilde is much closer to my personality as far as her philosophy. I understand her. Brünhilde is wide open and naïve and innocent, full of love and faithful, and true and strong, and courageous from the very get go. Eva: What roles are you anticipating in the next two or three years? L. Lindstrom: In the last two years I’ve added all three Brünhildes. I’ve added the Färberin in Frau Ohne Shatten. I’ve also added Marie in Wozzeck and I’ve just done my first Mahler 8. There are two things I really want to add. I’m dying to do a Minnie in La Fanciulla del West. It’s maybe the most dramatic opera that Puccini wrote. I love Puccini. I will always cry at La Boheme because I love it so much. I love Tosca. I love Il Trittico; I love Suor Angelica. It’s so gorgeous. Madame Butterfly is an absolute masterpiece but Fanciulla for me is really another apex of creation. I’d also love to sing Isolde in Tristan and Isolde. I don’t want to be too greedy. I’m not sure if beyond that there’s anything else out there. That’s my wish list. Eva: Is there any one memory or moment that stands out in your career as unique in the emotion it brought to you, or where you had a special or unusual moment with the members of the cast or audience in terms of emotion or communications? L. Lindstrom: My Met debut in 2009 was an astonishing event. I was the understudy for Maria Guleghina and I went on for the premiere. She had not been well but she was going to sing the opening night and then one hour and a half before curtain they called and asked me to get to the theater. That was absolutely extraordinary. That production of Turandot is amazing and to share the shoes, figuratively, with Eva Marton, Sharon Sweet, Alessandra Marc, and on and on with these historical amazing singers! It was also personally a hugely poignant moment because my mother was very ill and dying of cancer. My mother was a singer and my voice teacher and my champion. I was able to call her and say to her I was going on that night, that it was a live radio broadcast and to make sure she tuned in. You can’t top that. Even now I get so emotional. The first time I sang Götterdämmerung [in Melbourne in December 2016] in a production and I got to the end, the final scene, when you’ve already been going for four or five hours already, the orchestra started to play the opening chords and I thought, oh my gosh I’m really going to do this! This is really going to happen. We were in some kind of suspended moment together, me and three thousand other people. At the end of it, they just went absolutely berserk. To have that shared frisson, that sort of suspended element for that amount of time, it changes you, and it brings you to the realization that all of those clichés are so true. Art changes lives and music is powerful. We are all seeking for connection. We might get slightly off kilter every once in a while but we really want to connect. If I can be that instrument of connection, I feel really lucky. Eva: As a member of the audience I feel that kind of connection and I was wondering if you as a singer feel it too. L. Lindstrom: We feel it too. All of a sudden there is a surfing thing that happens. As a singer I just have to not panic and get too nervous because that will somehow close the circuit. It’s such an extraordinary exchange of energy. It’s just great. Eva: Is it well accepted around the world to be an American opera singer or is there a general preference for any European or specific national techniques and styles? L. Lindstrom: I can say easily that I have had no negative experience specifically because I’m an American. In general, even the Europeans would agree that American classical singers are of the very best trained, very best, and most professionally prepared singers in the world at this time. This has been for quite some time. There is a definitive sound that Americans have versus the Germans vs the Russians vs the Koreans. That’s also the glory of it, that we all have unique speech and language patterns and sounds that we chase to recreate, to imitate, or to resonate. One of the things that does set Americans aside is that there’s so much to the American work ethic, in the sense that this country really was based on the idea that you can become whatever you dream of. That entrepreneurial mentality of work hard and you’ll find success really helps American singers in an internationally competitive position. Eva: How do you deal with the stresses of constantly traveling from coast to coast from one major opera house to another? How do you find balance? Is this the career you imagined you have? L. Lindstrom: It’s nothing like I thought it would be. It’s much more difficult than I ever imagined. It’s also much more fabulous than I ever imagined. It’s fabulous because travel the world and I work with beautiful, amazing, creative human beings. I meet people in the music business and not in the music business. I’m constantly surprised and validated in my hope for humanity. People really are good at heart. The difficulties of traveling and never being home are more exhausting than I ever could have imagined. A successful opera singer has to really find ways to always be at home wherever they are. You have to find your sense of home no matter where you are. Eva: How do you do that? L. Lindstrom: Home evolves to be the thing in you, not where you’re going. So you’re always home, even if it’s in an airport overnight because your flight was canceled, even if it’s in a hotel for three days and another hotel for three days and yet another hotel for three days because you’re on tour, even if you have a temporary apartment for two months, which we frequently do when we do new productions in Europe. You set up home and you start cooking your meals, shop at the same supermarket, make friends at the café, and buy bread from the same person every day but then comes the day when you have to pack up and leave. You leave your temporary home but your real home goes everywhere, it’s always on your back, it’s always with you. I spent a lot of time in my career yearning to get back home, yearning for that perfect home. So maybe take that yearning thing and just check it because it’s not really serving me. I am home wherever I go and I’m going to be home with myself. I have my network of people I can call. Thank God for cell phones, Whatsapp and all the technology that we have. I also really know now the value of taking time off when I’m not learning or practicing a role. Time off where you’re just really a civilian on vacation on a beach or in a chalet is mandatory. Your brain just can’t take it. You need a private life. So home has to be in you. You have to choose time off and you have to have a private life that brings you joy. Singing is joyful but you have to have something that’s absolutely private just for you.